Game changer right here you guys!! This one is for all the Fettuccine Alfredo fans who steer clear of ordering or making such a dish because it’s traditionally highly caloric and also very high in fat content. Quite frankly, delicious but simply not good for you! Well, this is why this is a game changer: This sauce has cauliflower as a base, which has a very forgiving taste, it’s low calorie, low fat, full of nutritious content and the taste was not sacrificed, only amplified by seasonings! Cauliflower is also rich in vitamin C, protein, vitamin B6, folate among others. It’s highly nutritious and super versatile. For example, I love making cauliflower crust pizza. I feel like you can really make anything with it! Spaghetti squash mimics traditional spaghetti perfectly, except it is gluten-free, quite low calorie and packed with vitamin A and potassium. This one is perfect for those looking to cut down on carbs but still have a satisfying meal!You’ll see what I mean when you look at the ingredients! Set oven to 425F. Arrange an oven safe dish to bake your squash in. 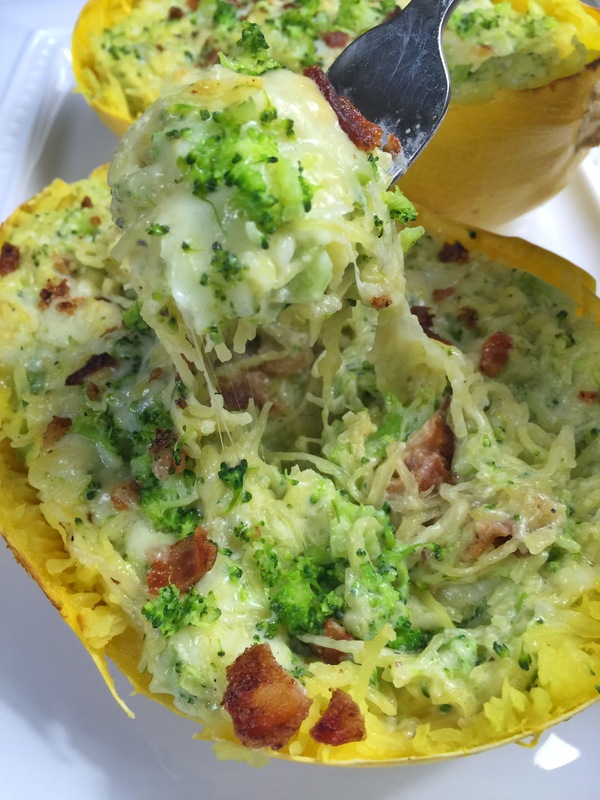 Poke holes all around spaghetti squash with a fork. Really go to town on it, as it will allow steam to be released from it as it bakes. Bake for about 45 minutes depending on the size of the squash, turning it about halfway. It will be ready once you can easy cut through it with a knife. Allow it to sit for 5-10 minutes before handling. Chop the cauliflower. Bring the vegetable broth and water to a boil over medium high heat and add cauliflower. Cook until cauliflower is soft, about 15 minutes; the longer you cook it, the smoother the sauce will be. Melt the butter in a large skillet over medium heat and add the minced garlic and sautée for 4-5 minutes or until soft and fragrant. If you’re using traditional pasta, go ahead and cook it now, reserving 1 cup of starchy water for the sauce. Transfer cauliflower to a blender with about 1 cup of the broth. You may need to do this in batches depending on the size of your blender or use a hand blender. Add the sauteed garlic, salt, nutmeg, and black pepper and puree until very smooth, about 5 minutes. Once the mixture is moving, stream the olive oil into the blender. Add more broth or water if the mixture is too thick to move through the blender. You want it to turn through the blender easily. When puree is very smooth, transfer back to the butter/garlic skillet. Add the cream or yogurt and cook over low heat. Add the starchy pasta water (or regular water if you’re not making pasta) and keep warm until ready to serve. Cut squash in half, gut out the seeds and use a form to pull the spaghetti squash strands. You have 2 choices here: either add the sauce directly to the squash with the loosened spaghetti squash, or transfer the strands to a bowl. I like to add the squash to a bowl. Transfer the squash (or traditional pasta) to the sauce pan and incorporate the sauce until well mixed. Add the chopped broccoli. Feel free to add the bacon as well, saving some for sprinkling on top. 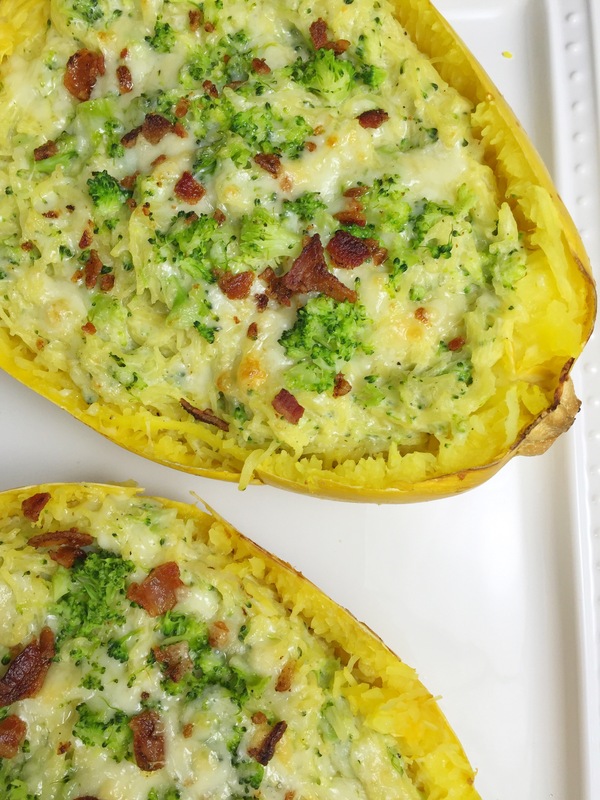 Transfer the spaghetti squash back to the squash bowls or an oven safe pan, sprinkling with parmesan cheese and remaining bacon over the top. Broil on high for 2-3 minutes or until cheese bubbles. Now it’s ready for consumption! SNAPCHAT: AnaSandee – I will continue to snap and cook so get the recipes in real time before they make it to the blog! Of course I’ll also be sharing some more awesome things about the pregnancy as I learn them! Videos stay up for 24 hours. 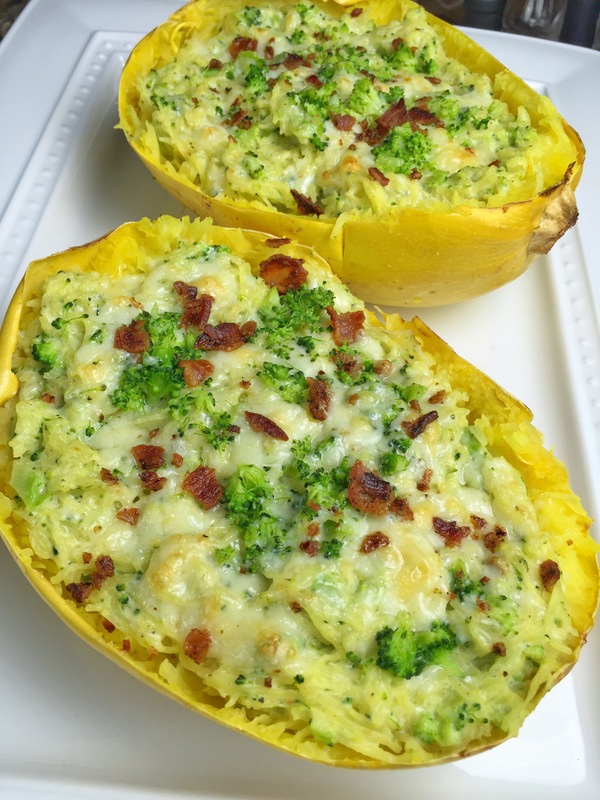 This entry was posted in Saucy Pastas, Uncategorized, Wine and Dine and tagged cauliflower alfredo, faux alfredo sauce, healthier alfredo, healthy alfredo sauce, spaghetti squash, spaghetti squash bake. I love watching your snapchat stories! I just went grocery shopping and I have all of the ingredients for the Cauliflower Alfredo Spaghetti Squash Bake! I’m looking forward to making it this week! YAY! You’re going to love this!!! Thanks Nicole! We are so excited as well! I hope you enjoy and remake thtis recipe!! Thanks Nicole! We are so excited as well! I hope you enjoy and remake this recipe!! Thank you so much! And it definitely is….surely rocking my life! I am confused. Do you use BOTH spaghetti squash AND traditional pasta? Or choose between them? Simple. You may use on or the other, OR you can use both – this is a great trick to get someone to eat more veggies! Add the spiralized veggie to similar thickness pasta!